I moved over 20 times while in the Army, and three times since I’ve been retired. All three have been by Craig Van Lines; after the first move I didn’t bother with several estimates, I just called Fred Craig. They’re just THAT GOOD- THAT RELIABLE. In all my moves, I’ve never seen crews that worked so well together. Very impressive. 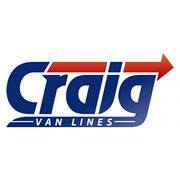 I strongly recommend you call Craig Van Lines. Lastly, the final bill was close enough to the estimate that there was no argument from me. Absolutely the best. Very professional and friendly. Easy to work with. This review sounds as if you were not happy with the services we provided to you. We have not heard any complaints from you regarding any issues that you had with your move. Please let us know how we could have exceeded your expectations, as customer satisfaction is our number one goal. The CVL Team was a pleasure to work with. All personnel were polite and efficient, and extremely hard working. My wife and I cannot say enough about CVL's professionalism and willingness to please. Having been military/government for 30 years and moving 15 times, we can say with confidence that our moving experience with CVL was the best yet. Thank you very much for the review. Understanding that you are quite experienced at moving, this is quite a compliment. We appreciate it so much and welcome the opportunity to service your relocation needs in the future should the need arise. Craig Van Lines facilitated our recent move from Stafford to Spotsylvania. We have nothing but positive comments for this family run business. Dave Reed came and gave a free and complete estimate. Deligney Sosa in the office scheduled the pick up and delivery with efficiency and was pleasant to work with. The crew headed up by Eddie was terrific! They arrived on time and were very helpful, courteous, and cooperative. Several of the guys came for the pick up and then again for the delivery which was nice. Extremely professional group all the way around! Would highly recommend them if you are looking for a moving company! Thank you so much for taking time to complete a review of our company. We are so pleased that you were satisfied with the services we provided and welcome the opportunity to service your relocation needs in the future should the need arise. Excellent Experience, would highly recommend! The Craig Van Lines team was professional, courteous, efficient, and wonderful young men who demonstrated what hard work and a strong work ethic looks like. Thank you for your review. We take much pride in our business and our employees and we are so pleased that it shows.